Mannekin Pis in Brussels is an extremely curious tourist attraction. It’s normal to find crowds of people gathered around it taking photos, but when you see it you have to wonder why! 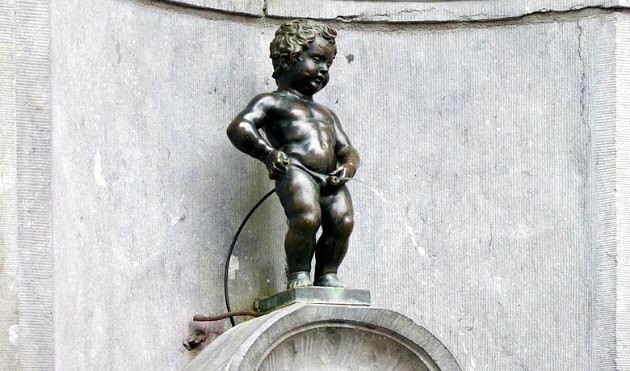 In essence it’s just a tiny statue of a little boy urinating. Nothing else. Oh, and some metal railings. Anyway, bizarre as he is, the sculpture has become one of the must-see landmarks in Brussels. You have to go to say you’ve seen it, but it’s not worth spending a lot of time to do it. We were really surprised about how small the statue is and slightly bemused about why he’s as popular as he is. Occasionally you’ll find he’s been dressed in a costume which can make him a bit more interesting. The most common time to find the statue in a costume is at Christmas when he is often dressed in a red Santa Claus outfit. There are now security cameras up to stop him being dressed in anything ‘unofficial’. 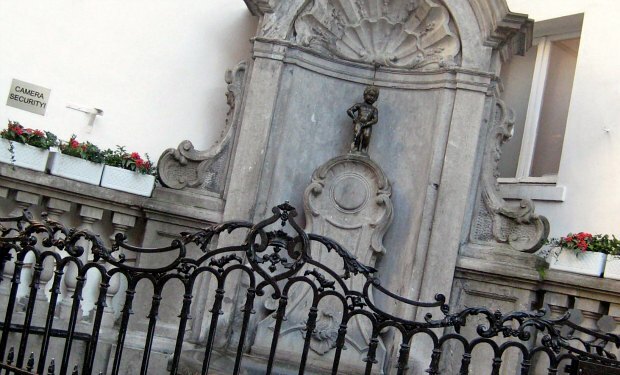 The Manneken Pis is at the junction of Rue de l’Étuve/Stoofstraat and Rue du Chêne/Eikstraat and is only a short stroll from the Grand Place.